Are you ready to reach your greatest potential? Our comprehensive, integrated, free Jobs & Internships programs will give you so much more than just a job placement – we’ll help you explore different career paths and gain the skills to help you find and keep the RIGHT job. Check out our many options to pick the right program for your background and goals! The first step to joining any of our programs is to become a Door member. Please be aware that unless otherwise noted, all of the programs below are at our main Manhattan location. Available only in our SoHo location, this program helps young people ages 16-24 who have a passion for cooking get started on an exciting career in the culinary field. Find out how in 10 weeks you can get certified as a food handler, get hands on training and a job in the field. At the end of the program, we’ll also help you find a job in the field and you can take advantage of free advanced trainings through the City University of New York in areas such as culinary arts and front of house hospitality. Our next cohort for the culinary program starts on January 9, 2017; the second cohort of the year begins on March 13, 2017. Additional cohorts will be announced later in the year. To learn more about the culinary program, contact Christina Jackson at 212-941-9090. ext.3228 or cjackson@door.org. The Door’s comprehensive career and education program to help you finish your education and gain job and life skills for your future. If you’re out of school and/or out of work and looking to both finish your education and find a job, then EPOCH is the right choice for you. Infused HSE: This option will teach you the skills you need to pass your HSE test while preparing you for a career at the same time. Classes are Monday through Friday, 9 a.m. to 4 p.m., and include HSE material, leadership development, and an opportunity to explore your career interests. Infused HSE students can also apply for in-house, paid internships and receive other stipends and incentives for participating. CITE (College, Internships, Training and Employment): If you already have a high school degree or HSE – or if you need a job right now – this program is the option for you. Our coaches will help you get a job or internship, or get you enrolled in a college or vocational program. We’ll also help you develop an action plan – a must-have strategy for lasting success – and stay with you while you get settled into your new job or school. To learn more about EPOCH, contact us via phone at 212-941-9090, ext. 3368 or email EPOCH@door.org. 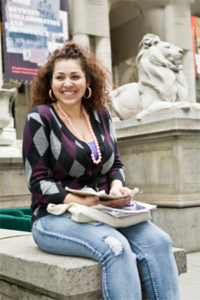 Our LEAP program targets young adults, ages 16 to 24 that are system involved (self-report experience with the juvenile justice system, foster care system, or have experienced homelessness) AND are pursuing one of our post-secondary bridge programs (EMT, Woodlawn, TechBridge, or Bridge-to-College in The Bronx and Bridge-to College In Manhattan). LEAP participants receive extra one-on-one support, additional monetary incentives, leadership opportunities and follow-up support for 10 months post completion of their bridge program. The Academy exists across both our Bronx Youth Center location and our Manhattan location. The Academy is a unique program designed to prepare foster care youth for adulthood. It offers one-on-one academic and employment services together with supportive counseling for young people who are participating in either our supportive housing/Runaway Homeless Youth services and/or our career and education programming and self-disclose having experience with ACS/the Foster Care system. To learn more about This Way Ahead, contact Andre Nelson at 212-941-9090, ext. 3362 or by email at thiswayahead@door.org. You can also visit Gap’s website to learn even more about the program. Available only in our SoHo location, Work Readiness Customer Service (WRCS) program runs for 5 weeks, where participants will learn employment skills that will help set them up for success; skills such as time management, effective communication, workplace behavior and much more. Upon completion of the program participants will have a Resume along with Cover/Thank you/Resignation letters to serve as a template for future endeavors. Culinary receives the ServSafe Food Handler Certification from the National Restaurant Association. Following the completion of workshops, participants will be funneled into Job Club where skills are reinforced and employment opportunities are presented. Follow up services is provided to the participants for a year, where job Developers and Coaches will continue to provide support to ensure success in the workplace. Calling all Young People ages 18-24! Looking for a meaningful career? Love to work with your hands? The Door is now recruiting for our Spring 2019 cohort of the Woodlawn Preservation Training Program, held in partnership with The Woodlawn Cemetery and Conservancy. Each spring, The Woodlawn Preservation Training Program (PTP) selects 20 Interns to receive specialized hands-on training in masonry and restoration under the guidance of a Resident Craftsman. 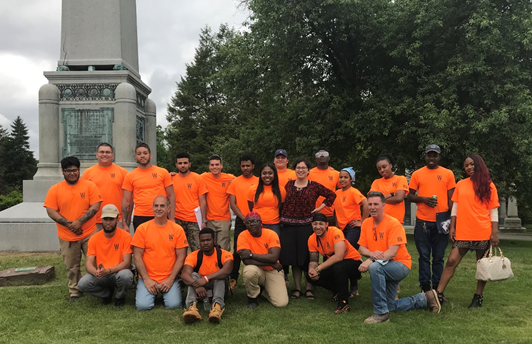 The PTP is a paid nine-week career training and job placement program which focuses exclusively on the restoration and preservation of stone typically found in historic cemeteries. Graduates of the PTP will earn an OSHA-30 Safety certification, Suspended and Support Scaffolding certifications, Jahn Mortar certification, and support applying to entry-level positions in the industry. Please click here to download a copy of the 2019 application. Applications will not be reviewed unless they are submitted completed with resume and essay. Selected candidates will also be asked to complete an in-person interview, a written test (reading & math) and a physical agility test. This is a 12-week program that gives committed young people ages 16-24 who are out of school paid work experience in a variety of professions. If you’re out of work and not enrolled in school and need some help with job placement, this is a great program for you. Intern and Earn is a two-step process. First, you’ll have a two-week job readiness training class, held Monday through Friday from 9:30 a.m. to 3:30 p.m. You’ll learn how to work as a team and as a leader, develop time management skills, improve your professional attitude and communication, and more. After the two-week class has ended, you’ll move on to a paid, 10-week internship experience. In the year that follows your internship, we’ll work with you to lay out your future goals and set you on the right path to meet them – it could be preparing you for college or vocational school, or helping you find additional internships or job opportunities. We also have additional resources for young people who have experience with the foster care system or the criminal/juvenile justice system (known as YAIP+). You must become a member of The Door to join the Intern and Earn program. After becoming a member, we’ll need you to attend an orientation session to make sure you’re ready to join this intensive program. Orientation sessions are held Tuesdays at 11:30 a.m. and Wednesdays at 4 p.m. You should bring a social security card, birth certificate, proof of residency, and government-issued ID with you to the session. Intern and Earn is available at both our main location in Manhattan and our Bronx location. To learn more about Intern and Earn or Intern and Earn+ at our Manhattan location, contact Antoinette Washington at 212-941-9090, ext. 3237 or by email at antoinette@door.org. To learn more about Intern and Earn or Intern and Earn Plus Bronx location, contact Shamek Johnson at (212) 941-9090, ext. 3515 or by email at shjohnson@door.org. Get more information about our Career & Education programs by filling out this simple form now! Click here to view our available jobs and internships.